After our Christmas dinner, but shortly before sunset we took a walk along the Strait of San Juan de Fuca, starting at Morse Creek. As we headed east back to the parking lot we were extremely aware of the failing light and the cloudy sky. 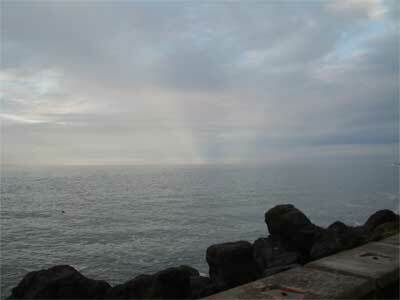 We also noticed dark streaks in the sky towards the east, directly opposite the direction of the setting sun. These were not pillars of smoke, but something more interesting. They were the shadows of clouds cast by the setting sun. (Move your mouse over the picture to see a contrast exagerated view). Basically, when the sun is low, cloud shadows can be hundreds of miles long. They are most visible when viewed parallel to the direction of the casting light and area least visible when viewed perpendicularly. Because of perspective effects, the rays appear to diverge from the setting sun, which was obscured by the coastal bluffs we were at the base of, and they appear to converge at the antisolar point on the horizon opposite the sun. We were exhausted from all our Christmas preparations and just wanted a place to stretch our legs so we checked out the Dungeness Dike Trail off Towne Road. It is right near the Dungeness Valley Creamery and Nash Huber's farm stand, so we could get some exercise and do some shopping. The trail is a little gem. We had seen cars parked at the dike access area, and we had heard that this was a good area for birding, but now we have discovered another little treasure. Read our report for more info. We haven't been doing too many updates this month because we've been really busy, and a lot of that busy has been decorating the house with Christmas trees. That includes the candle tree to the left. We usually have a little candle tree that fits on this old television table that we have, but this year all of the little trees were too scraggly or too lean or too something or other, so we bought the smallest tree we could find that looked good enough to decorate with cookies and candles, and that is the monster to the left. If you move your mouse over it you can see how it looks with the candles lit and the lights out. It is awesome to behold, and silent. For some reason candles seem quieter than electric lights. 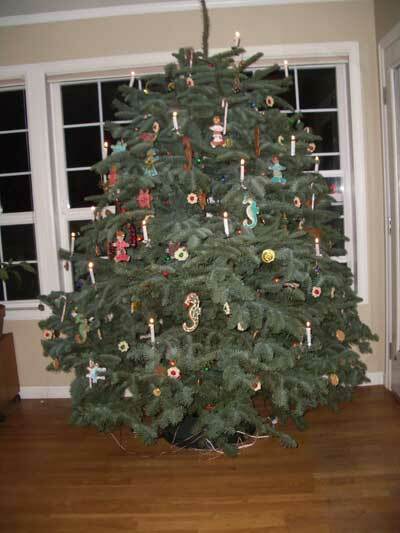 Here is our big tree. That's a nine foot ceiling so you get the scope of the thing. We could barely lift it, and only our engineering training enabled us to bring it to a proper vertical. We've crammed it with lights, ornaments and presents, so it looks pretty full, but it could take more. 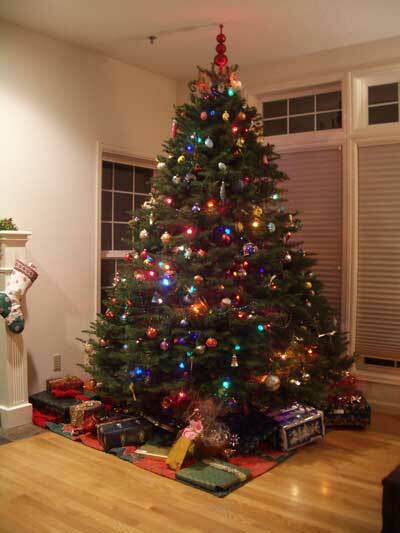 This is a truly huge tree, perfect for this season of excess. We actually had to cut off a bit at the top to fit the finial on, so we're glad we rushed out to the nursery right around Thanksgiving to grab one of the giants. 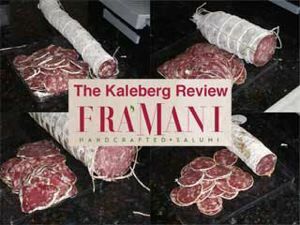 We have long been fans of Salumi in Seattle, so when we heard about Fra'Mani in Berkeley we had to check out the competition. The comparison was not as simple as we had thought, and Fra'Mani is a serious contender. Can you guess our favorite? We are being deliberately coy here in hope that you will read our review. We hadn't heard from Harley or seen any of his eggs at his stand or in the markets, so we were wondering. Luckily, Port Angeles is a small town, so we just ran into Harley at the local supermarket and got the story. Basically, it's the season. Less light and an aging flock mean fewer eggs. 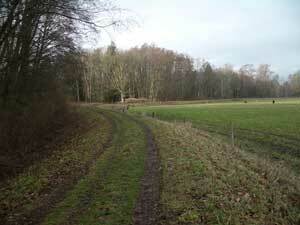 The big snow last Sunday was a big problem as well. Chickens are tropical jungle fowl, so they tend to stay in the coop when there is a foot of snow on the field. He hopes to have his new hens settled in and laying this January, so we have something to look forward to in the new year.